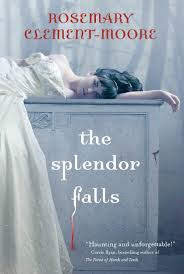 Clement-Moore’s novel, The Splendor Falls, contains several recognizable gothic characteristics including an atmosphere of mystery and suspense, an ancient prophecy, a heroine who experiences visions, and supernatural events (there’s ghosts galore). Sadly, the book is too long and too slow to add up to much that would be considered frightening. Seventeen-year-old Sylvie Davis is the “youngest-ever principal dancer for the American ballet” when she suffers a freak accident which ends her dancing career forever. Dancing is all Sylvie has ever known and the fact that she no longer can sends her into a tailspin of depression which is completely understandable. What is not understandable, however, is the fact that she starts to see things that she can’t explain. She starts to doubt her sanity and her mother, who has recently married a psychiatrist, decides to send her to her deceased father’s ancestral home in Alabama. Sylvie and her purse dog, Gigi, arrive at Bluestone Hill, a plantation house which is currently being restored by her father’s cousin, Paula. It won’t take long for the reader to recognize the bit-players: the snotty daughter of Paula’s business partner, Clara; the golden-boy president of the Teen Council, Shawn; the mysterious and handsome, Rhys. Sylvie is petulant about her circumstances. She doesn’t really know, Paula, and knows even less about her father’s childhood. It seems, though, that everyone in the small town knows her family. To make matters worse – she starts seeing things and hearing things. The reader, by rights, should be creeped out right along with her. I can’t quite figure out why I wasn’t. The Splendor Falls’ biggest problem is, I think, with pacing. At just over 500 pages, there just weren’t enough thrills and chills to keep the pages turning. The novel’s denouement, when it comes, doesn’t really live up to its potential. I’d been really looking forward to this book. I loved the title and the cover and the promise of things that go bump in the night, but at the end of the day the book was more whimper than bang. This entry was posted in Book Chat and tagged 2014, Book Review, mystery, teen by Christie. Bookmark the permalink.